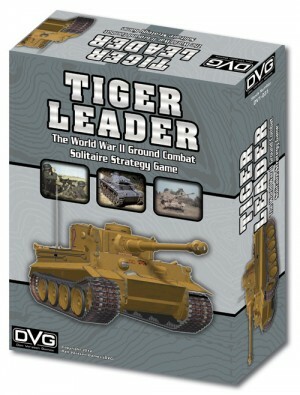 Tiger Leader follows in the tradition of Hornet Leader and Thunderbolt-Apache Leader but takes those game systems down in to the mud and in to a whole new time period – World War II! In Tiger Leader, you’ll be in command of a German Kampfgruppe of tanks, armored cars, trucks, halftracks and supporting infantry. You’re Kampfruppe may also be assigned air support and heavy weapons support in order to achieve your goals. Your goals are to take your objectives while trying to keep as many of your men alive as possible during realistic tactical missions. Tiger Leader features 7 historical campaigns and 1 hypothetical campaign (Operation Sea Lion) which can be played as individual campaigns or linked to form 1 huge mega campaign which follows your troops from the Invasion of Poland to the final battles on the Eastern and Western fronts. And the hypothetical invasion of England – Operation Sea Lion. A major part of the game is mission planning. You decide which vehicles and infantry units to use and which commanders are best for the mission. Vehicle and infantry commanders are rated for skill level and even personality quirks such as how well they keep their heads while under fire. Deciding which commanders are used for each mission is a major consideration. Your units will become fatigued with every mission. If you push a commander and his men too hard, his skills will degrade. Your commanders and their crew also gain experience with every mission. This makes for some great decision-making. Should you keep fighting with your top commanders and crew and further fatigue them to get the job done, or let the new guys fight in order to prep them for the tough missions ahead? Missions are quickly resolved using an area movement system to display tactical combat. Speed and realism take top priority in this game. Terrain cards randomly generate each battlefield. Double sided terrain tiles provide everything from cities and farmland to snow covered forests and hills to sand dunes and oases. During combat, you get to resolve every fight with enemy tanks, infantry, anti-tank guns, and squads of infantry. Each enemy tank, truck, infantry, etc is represented by its own counter on the battlefield. A unique fog of war system adds to the tension of the combat as unless you have a clear line of site to the enemy, you may not know exactly what is coming out of the morning fog towards your tanks until it’s too late. After combat, you can rest and refit your vehicles and infantry. As new technology becomes available, you can replace older obsolete tanks with newer and deadlier models such as the Tiger, Panther and even the deadly King Tiger! If you’ve played Hornet Leader, Phantom Leader or Thunderbolt/Apache Leader, you’ll make an easy transition into Tiger Leader. We’ve included the cards for every commander to progress in experience from Newbie, to Green, Average, Skilled, Veteran, and Ace! An all-around excellent solitaire game. Manage your commanders as well as your hardware to be a successful Kampfgruppe commander. Intuitive and fast-playing game system. Enemy Units include units from the Polish Army, French Army, British Army, Russian Army, and the American Army. This game is perfect for both expert level military gamers as well as first time gamers. The core rules are easy to grasp and very intuitive, while still giving players a wide variety of decision-making options and tactical choices. The game can also be played co-op (like our other Leader games) by splitting-up the units and planning/resolving missions as a team. Each mission requires only in 30 to 60 minutes. Each campaign consists of multiple turns in which you’ll have one or more missions each day.